Now we need to create Kendo DataSource. While creating Kendo data source we can configure it for reading and creating records. To read values in the transport of data source set the value of read property with READ_URL. In below image you will notice that we are setting type of data source as odata because we are interacting with database via OData service. To read data you need to set following attribute of Kendo datasource. url: OData url to created record. datatype : this should be set to json or xml. 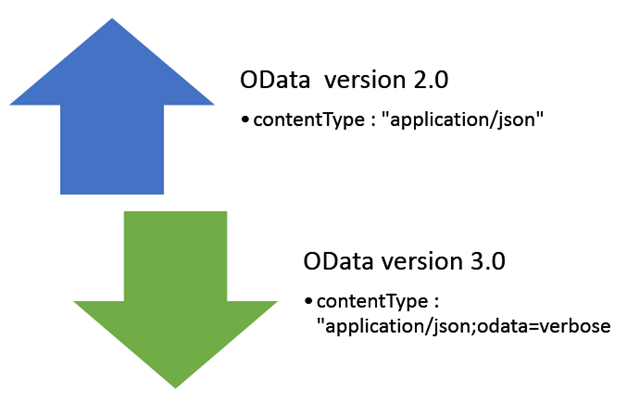 For OData version 2.0 contentType should be set to application/json .However in case of OData version 3.0 it should be set to application/json;odata=verbose. After configuring Kendo datasource to create record, we need to set the schema of the kendo datasource. We must set schema of data source to successfully perform create record operation. 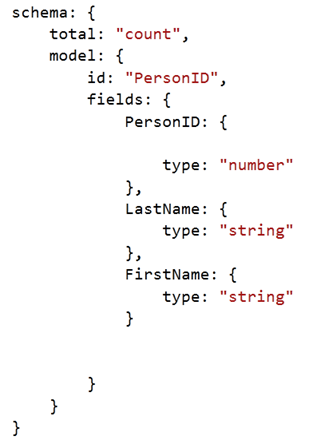 In the schema, we need to create model defining different fields or columns. We need to provide type of the columns. Other types can be number, date, and string. Make sure you are setting total property of schema with count. As of now we have created data source to perform read and create operation. Now to create a record we need to create an item. Item can be created from reading values from the view. After creating item call add function on data source. Last step is to sync data with the server. This can be done by callinf sync function on the datasource. In this way we can create or insert a record in database from Kendo UI data source using OData service. I hope you find this post useful. Thanks for reading. Great article for beginners, thanks. Do you have an article showing similar details required for update of a modified record? Thanks that you like article. I will write on requested topic soon !